Disclosure: This post was made in partnership with the US Highbush Blueberry Council. Thank you for supporting the growth of Food Heaven! Need a healthy grab ‘n’ go breakfast idea? Well, you needn’t look any further. (Yes, needn’t is a word.) 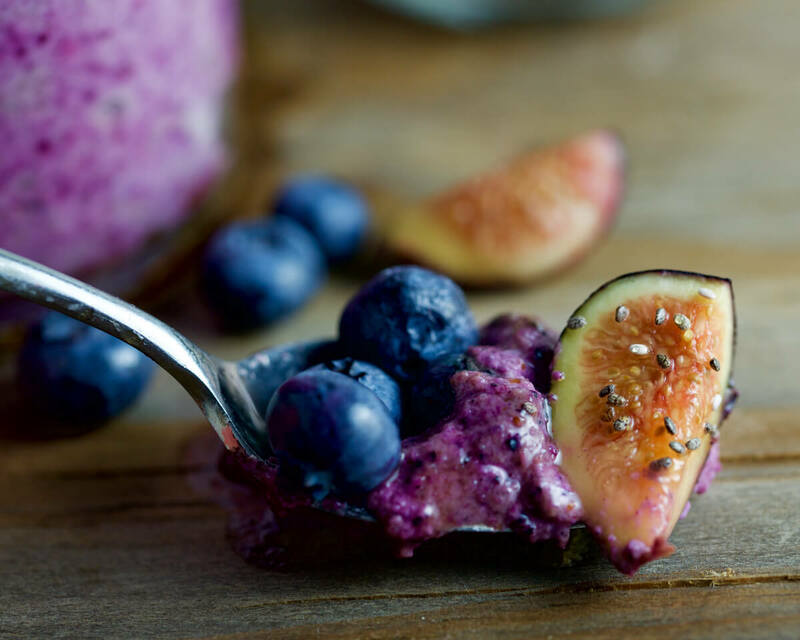 These blueberry overnight oats are the answer to all of your breakfast prayers. In case you missed it, overnight oats are the latest breakfast craze to hit the interwebs. As Registered Dietitians, this is one of the very few crazes that we can get behind. If you haven’t heard of this phenomenon, here’s a simple equation of how overnight oats work: Oats + liquid + time (i.e overnight) = oatmeal ready to go in the morning. No cooking necessary. Not only are overnight oats great for people who have limited time in the AM (read: EVERYONE), they are also super nutritious. Oatmeal is one of our favorite grains because it’s packed with complex carbohydrates, and it’s an excellent source of manganese (which plays a role in bone production and skin integrity). It’s also a good source of protein (at almost 7 grams per serving), fiber (4 grams per serving), and a ton of vitamins and minerals such as biotin, copper, zinc and magnesium. Speaking of blueberries, incase you missed it, this year we became official spokespeople for the U.S. Highbush Blueberry Council. 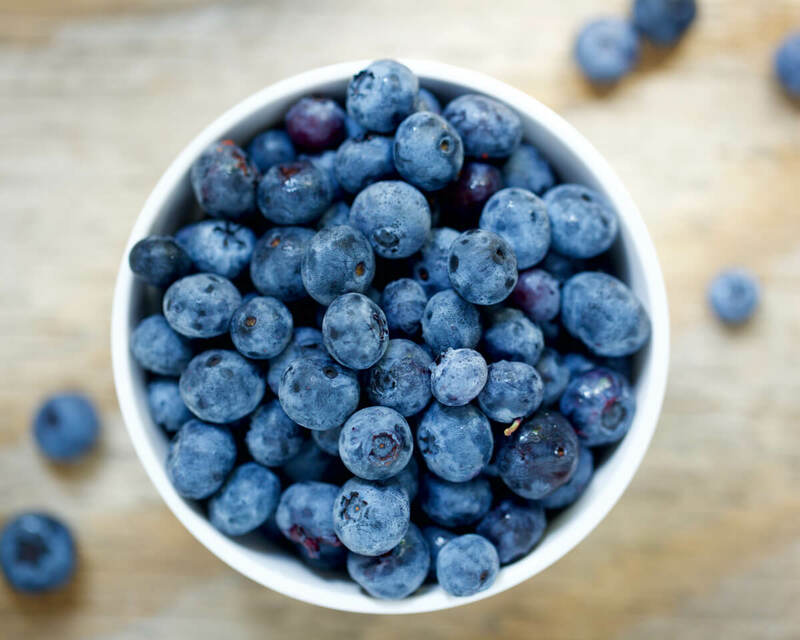 As part of the “Blue Crew,” we’ve developed a 6-part series of healthy blueberry recipes that are literally knock-your-socks-off delicious. Each recipe is also in video format, which means you should subscribe to our Youtube channel, if you haven’t already. To make this recipe you need to do is add all of the ingredients into a blender. Blend until a chunky smooth consistency is reached, and pour into a small jar. Next you’ll refrigerate in the jar with a lid on, overnight. Enjoy in the morning! 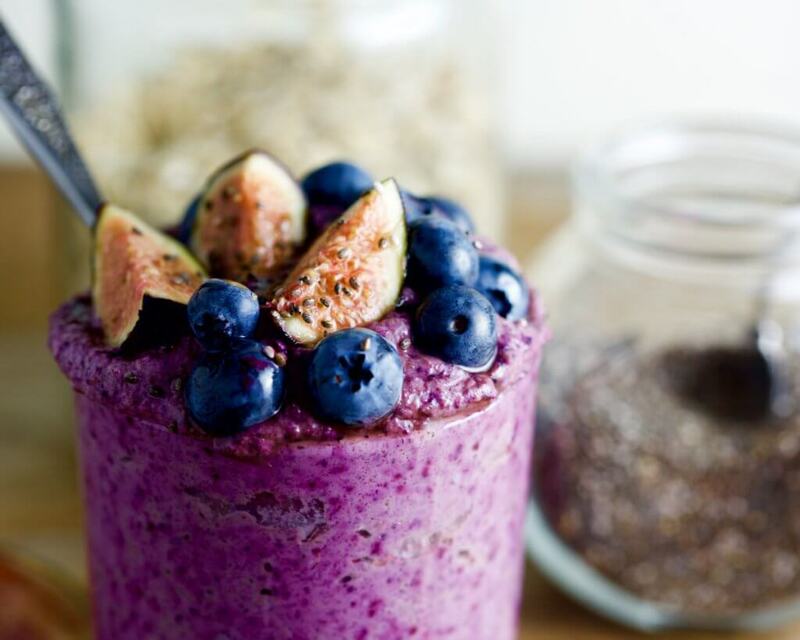 You can top it off with fresh blueberries, your favorite fruit (we used figs), and/or chia seeds! If you give this recipe a try, let us know what you think in the comments below how you liked it. Until next time! Optional: top with fresh blueberries, your favorite fruit (we used figs) and/or chia seeds!